Curiosity entered the the area dubbed Yellowknife Bay on sol 125 (Dec. 12) and after a few quick dashes around made a beeline to the outcrop on the north side of the depression, where it has been parked for several days as it looks for a promising rock formation to test out the drill at the end of its robotic arm. Might this be more of the conglomerate-type rock that was seen near the landing site, that tipped off the Mars scientists that the general area once had flowing water? So far they haven’t said anything publicly about what they’re seeing at Yellowknife Bay. 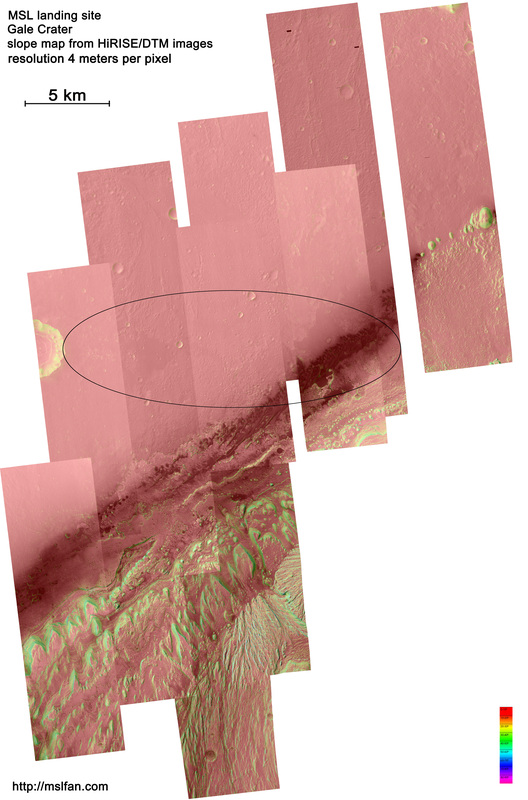 The “riverbed” conglomerate (“Hottah”) was found on Sept. 15 at the elevation and drive distance shown by the red dot above. 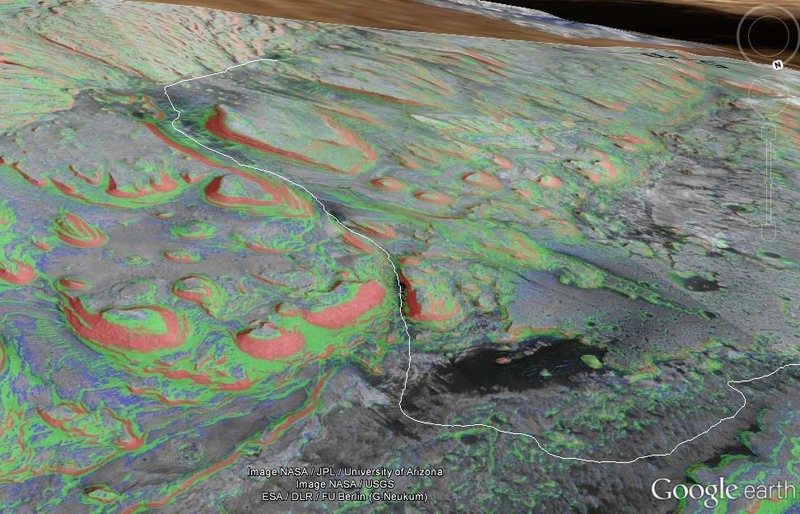 The good people working on the High Resolution Imaging Science Experiment (HiRISE) at the University of Arizona have provided several digital terrain model (DTM) files of the expected MSL landing site at Gale Crater. 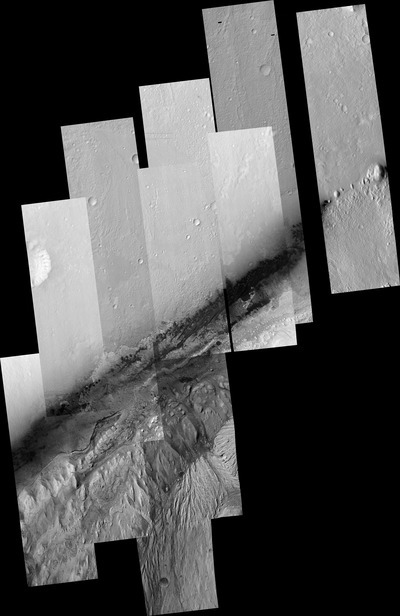 These files give, at a resolution of one meter per pixel, the elevation of the Mars surface shown in the corresponding visual images taken by the HiRISE camera. It’s important to know the slope because the practical limit for the Curiosity rover on its drives is 25°. 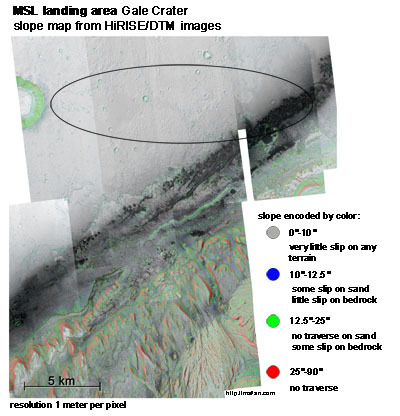 Thus it can be seen that areas of the map colored red, orange or yellow are generally traversable by Curiosity (at least on the basis of slope), while the other colors green, blue, indigo and violet are increasingly off-limits. 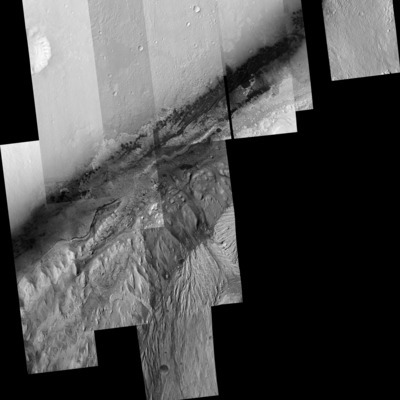 MSL will land in the relatively flat upper left landscape shown in this mosaic of images taken by the HiRISE camera aboard the Mars Reconnaissance Orbiter. 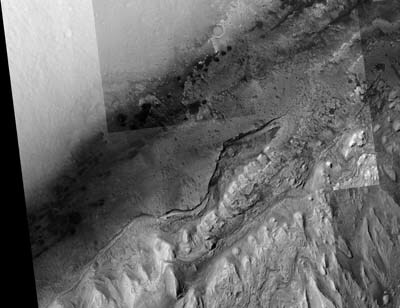 From there, the rover will travel to the more rugged landscape to the lower right (dubbed Mount Sharp, in the center of Gale Crater). The resolution of this image is 1 meter per pixel. Turns out a lot of image programs (e.g. Photoshop) can’t display images greater than 30,000 pixels or so on a side. GIMP (free software) can handle the file. A blog about the Mars Science Laboratory mission to Mars, scheduled to land August 5, 2012 at 10:18 pm Pacific Time.